A good pair of white shoes can be hard to keep clean. 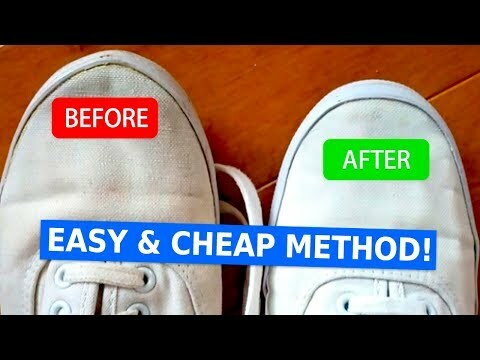 In today’s video, you are going to learn how to keep your white leather shoes and sneakers looking clean and fresh. 1/2 a cup of baking soda. In order to make this cleaning solution, start by mixing the baking soda with the apple cider vinegar. Rub this mixture on the dirtiest parts of your shoes, and scrub them using a toothbrush. Then, clean the rest of your footwear using a larger brush. After you’ve scrubbed them well, wash all of the shoe off with soap and water. Next, remove the shoelaces and let them soak in the vinegar and baking soda mixture. Let them sit for at least 20 minutes, then rinse them out with soap and water. While your shoes are drying, dust some cornstarch over them. After they’re completely dry, shake them in order to remove the cornstarch. Finally, rub a clean dry cloth over them. If you have rubber or leather shoes, you can also use this other recipe. All you’ll need is one toothbrush and some toothpaste. Squeeze the toothpaste on the toothbrush and scrub the whole shoe. You’ll gradually see the color begin to lighten. When you think it’s all clean, use a clean damp cloth to remove the toothpaste. Do you know any other tips for keeping your shoes white? Tell us in the comment section!